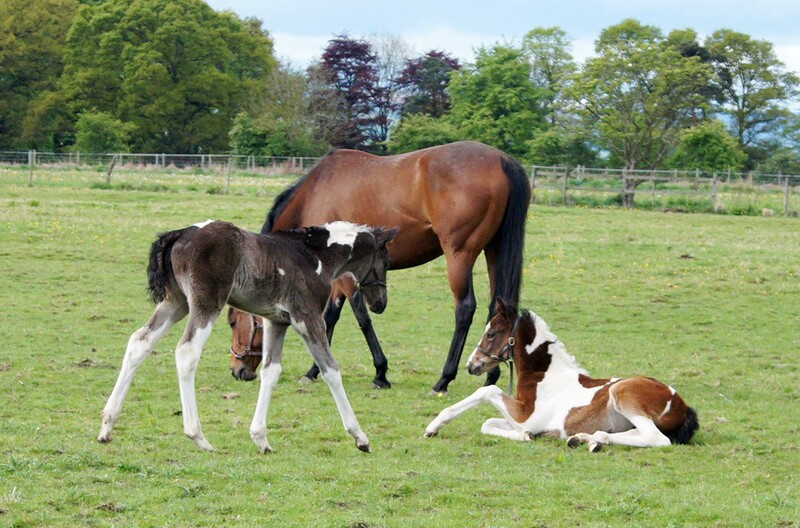 Everything about our coloured thoroughbred horse breeding stud in Great Ayton, North Yorkshire: Angrove Stud. Angrove Stud was founded in 2005 with the purchase of Angrove Dance Girl & Ricco we brought together the best coloured horses we could find, we gave plenty of thought to how to breed a UK version of the french chaser, with the best proven racing lines within their pedigrees. Why Colour? Well why not ? After all the colour is nothing to do with the breed, the colour gene Tobiano can be bred into any breed of horse. The intention was to breed a future stallion that was Homozygous for the Tobiano gene, we reached this first goal with our very first foal in 2007 when Angrove Spottedick was born. We achieved our second goal when we bred and raced Angrove Rumbaba in 2012 he made history by being the first coloured racehorse to be placed in the UK. AQPS are bred just the same as our stock,except they have blood on top, the old way of doing things,and they dont add colour genes, we prefer to use GSB TB mares from good proven familes as our starting point, our foundation stallion's pedigree is based on the TB sire line right back to the Darley Arabian so his male genes are GSB TB's. Ricco who was our foundation sire a 75%TB 25% coloured sports horse type,16.3hh black tobiano show jumper with £200 winnings BSJA, Ricco was by Captain Maverick a TB impeccably bred horse, by the influencial sire Nureyev a Black type winner, sire of sires and 135 stakes winners. Captain Maverick was out of Little Tobago Group placed,with progeny that have won at at Group 1,include- Play On & Monfarid black type placed,own brother to Captain Maverick, Monfaird sired group 1 winner Jaque Mate. Star Promise has joined us from David Barron's yard, she is well conformed, with a deep body and loads of heart room, nice clean legs and a lovey free walk, Star is a race winning mare and has won £5,646 on the flat she was also second twice, she has been homed with us as she was injured in training. Star's dam is the (Irish) bred Diamond Promise another race winning mare who is from a family of winners on the flat. Star's sire Mujahid won the Saudi Arabians Airlines Dewhurst Stakes Gr 1 he also was 3rd in the Earl of Sefton Stakes Gr 3, 3rd in the 2000 Guineas Gr 1 Mujahid is a sire of top class 7fl 2 year olds that later mature to high class milers. STAR PROMISE (GB), won 1 race (5f.) at 2 years and £5,647 and placed twice. STAR PROMISE (GB), see above. Pedlars Oath (GB) (2009 c. by Trade Fair (GB)). Cupids Ray (IRE) (g. by Fayruz), won 4 races at 3 and 4 years and £65,209, placed second in Abergwaun Stakes, Cork, L.
DOUBLE CARPET (IRE), won 6 races to 8 years and placed 10 times. ITALIAN FORCE (IRE), won 4 races in Italy at 2 and 4 years and £36,497 and placed 17 times; dam of winners. ITALIAN FRIEND (ITY), 5 races in Italy from 2 to 4 years and placed 15 times. DOWHATJEN (GB), won 4 races at 2 and 3 years and £44,226 and placed 14 times; dam of a winner.